For decades, scientists have estimated that the Siberian unicorn – a long-extinct species of mammal that looked more like a rhino than a horse – died out some 350,000 years ago. But a beautifully preserved skull found in Kazakhstan in 2016 has completely overturned that assumption. Turns out, these incredible creatures were still around as recently as 29,000 years ago. 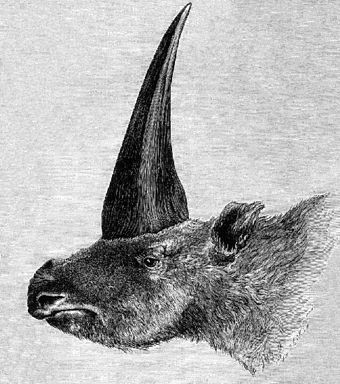 The real unicorn, Elasmotherium sibiricum, was shaggy and huge and looked just like a modern rhino, only it carried the most almighty horn on its forehead. According to early descriptions, the Siberian unicorn stood at roughly 2 metres (6.6 feet) tall, was 4.5 metres (14.7 feet) long, and weighed about 4 tonnes. That’s closer to woolly mammoth-sized than horse-sized. Despite its very impressive stature, the unicorn probably was a grazer that ate mostly grass. So, if you want a correct image in your head, think of a fuzzy rhinoceros with one long, slender horn protruding from its face instead of a short, stubby one like today’s rhinos. The skull, which was remarkably well-preserved, was found in the Pavlodar region of Kazakhstan. Researchers from Tomsk State University were able to date it to around 29,000 years ago via radiocarbon dating techniques. Based on the size and condition of the skull, it was likely a very old male, they suggest, but how it actually died remains unknown. The question on researchers’ minds is how this unicorn lasted so much longer than those that died out hundreds of thousands of years earlier. “Most likely, the south of Western Siberia was a refúgium, where this rhino persevered the longest in comparison with the rest of its range,” said one of the team, Andrey Shpanski. The team hopes that the find will help them better understand how environmental factors played a role in the creature’s extinction, since it seems like some may have lasted a lot longer than previously thought by migrating across great distances. Knowing how the species survived for so long, and potentially what wiped it out in the end, could allow us to make more informed choices about the future of our own species, as we find ourselves in a rather perilous situation. The results of the study have been published in the American Journal of Applied Science.